We need your nominations for the positions of Chair, Vice-Chair (up to 2), Secretary, Treasurer and Committee members. Please note that completed nomination forms must be received by the Secretary, Viv Spiteri by Wednesday May 22nd 2019 at the latest. For a nomination form CLICK HERE. Please print off the forms you need - one form for each nominee. Members may submit proposed and seconded motions for discussion at the AGM to the secretary, Viv Spiteri no later than Wednesday May 22nd 2019. CLICK HERE for a form for submission of a motion. The next meeting is on Wednesday, May 22nd - Chasing shadows in Warsaw: images of the Holocaust a talk by Vivien and David Harris. Vivien and David Harris are members of our U3A group. Vivien attends the Water Colour and Art Appreciation classes and David teaches the Literature group. Before retiring, Vivien in 2016, David in 2015, they both worked at JFS, the UK's largest and oldest Jewish secondary school which is now in The Mall, just off Kingsbury Circle. Vivien was the Staff Recruitment Officer and David was Deputy Headteacher. Last October, they spent 5 days in Warsaw, part of which was a Jewish heritage tour and part of which was Vivien's research into her family. This is the record of those few days. Advance warning: the August Monthly Meeting will be held on Tuesday 27th August in order to avoid a major bowls event at the club. Monthly meetings are held from 10.00 - 12.00 (unless otherwise advised) at the Century Bowling & Sports Club, Logan Road, Wembley (entrance between 51 - 53). There is a car park, but if it is full please park in Logan Road itself. There are no parking restrictions in Logan Road unless there are street signs indicating that it is an Event Day at Wembley. There will be a chance to ask questions of the speakers at the monthly meetings, refreshments will be available and there will be an opportunity to socialise. Please note: Guests will be charged £5 to attend monthly meetings. This will include refreshments. This amount will be deducted from their membership subscription if they join Kenton & District U3A. People who have not yet joined may come along to one interest group meeting without charge. See KU3A DIARY for dates, times, venues and contact details for all groups through to the end of August 2019. Look out for recent changes and additions highlighted in yellow. The visit to Guildhall on the morning of Friday 3rd May and The Royal Hospital Chelsea on the morning of Wednesday 8th May are fully booked, but you can join the waiting list. Theatre Outing - booking now! For the musical COME FROM AWAY which has just won 4 Olivier Awards, including Best Musical. Wedmesday July 17th - 2:30 performance - Phoenix Theatre, Charing Cross Road. Stalls seats (original price £69.50) for £35 or £45 depending on our group size. Booking and payment required before May 1st. Diana says: "I have seen thhis show and cannot recommend it highly enough. Be prepared for a huge standing ovation!" Contact Diana O'Reardon - see attached FLYER for details. Following up on his excellent talks in autumn 2017 assessing the lives and achievements of US Presidents, John Matlin continues his further sessions with Bill Clinton (April 18th) and George Bush 1 & 2 (April 25th). Current Affairs Discussion Group Lively group discussions normally every Monday at 10 am in the Bowls Club. However, plesae note that there are no sessions on April 22nd (Easter Monday) or May 6th and 27th (Bank Holidays). Play Reading - What Next? Our play reading at 2 pm on Monday April 29th depends on what comes through from the library in time. Vivienne has ordered Noel Coward's Hay Fever and some Dad's Army sketches, but it may have to be something completely different. New readers welcome. Healthy Living Group At the Tuesday 16th April meeting the group will be review the past year, look at current trends and plan next year's programme. In lieu of May's meeting, as Sonia is away, the group will have an outing to Kings College Science Gallery with a conducted tour of the exhibition Spare Parts on Tuesday April 30th at 11 am. Meeting at Wembley Park Station 10 am and going to London Bridge station. Music Appreciation - At the next meeting on Thursday May 9th, Herbie Goldeberg will continue to examine the life and works of English composers of the early 20th century. 2 pm at the Bowls Club. Art - Sketching & Watercolour This group involves members bringing their own materials to produce their own artwork in sociable company and share tips about the artworks they are creating. The next session is 2 pm Tuesday, February 26th. English Literature - At the next meeting on 10 am May 14th David Harris plans to finish taking us through some of the works of William Wordsworth and then onto Percy Bysshe Shelley, Lord Byron and perhaps the 'best of the lot' - John Keats. German English Film Club - What's On? Sara Maier is showing Path of Glory at 2:30 pm on Friday April 19th. Call to let Sara know (020 8908 0582) that you plan to come. If you plan to come please contact Ruth Levere on 020 8909 155 or ruth@levere.net or Richard Stanton on 020 8866 2041 or sirdickybird@aol.com. What are your Holiday Memories - It's Good to Talk! The next meeting of the group is on Wednesday May 8th when members will share their personal memories of region. This happy group welcomes new members and there's always time for light refreshments. 10 am at the Bowling Club. Contact John Collier for details 020 8904 2346 or johncollierjc@tiscali.co.uk. Rambling Group - where to next? This walk starts in Rickmansworth and goes along the River Chess for a short while then proceeds to Croxley Green and into Dell Wood which is managed by the Woodland Trust. It contains many dells where flint and gravel were excavated in the past. The path emerges into the Grand Union Canal at Lock 77, Ironbridge Lock. From here we will continue the walk through Cassiobury Park and return via the Met line from Watford. Meet at 10:00 am in Preston Road Underground waiting room. For more information about our Rambling Group please contact the coordinator, Kevin O'Doherty at kevin_odoherty@hotmail.com or phoning him on 07958 482843. Latin Group welcomes new members Did you do some Latin in your youth? The group, led by Charles Rudd, is seeking more members to look at the sense of real Latin texts and the English words, so many of which are derived from Latin. Interested? The next meeting is 2 pm on April 25th at the Bowls Club, then on June 27th (no meeting in May). Magic of the Musicals - Last session till September! Are you a regular at Mike Morrow's sessions? If not, then you are missing a treat. Mike considers anything that involves music and is performed in front of an audience is a musical. His last session for a while is at 10 am on Tuesday, May 7th. Cookery - The theme for May 2nd is asparagus to mark the short English season. Board Games Group - Rummikub & Scrabble The board games group is looking for more Rummikub players. This tile-based game for two to four players combines elements of the card game rummy and mah-jong. Interested to play or learn? Come along to the next session at the Bowls Club at 1:30 pm on May 7th. For further details of the above and other Groups, Walks, Visits and Outings and for contact details for the facilitators please see THE DIARY. We look forward to seeing you at some of our meetings and group activities. Do you have an idea for a new interest group, which you can organise or know someone else who might be persuaded to do so? Then contact one of the KU3A Interest Groups' Coordinators in person: Peter Rummer or Louise Bennett, or via email: ku3agroups@outlook.com. We have a specific request for someone to organise a Gentle Exercise group. If anyone knows of a trained person who could lead such a group please contact Peter or Louise. A reminder that if you book a holiday directly with Riveria Travel and nominate Kenton & District U3A, they will donate 10% of the final cost to us on your return. But you must mention that you would like them to do this at the time of booking. The donation can apply to the total cost of a group booking if the person making the booking is a U3A member. You may have seen their adverts in Third Age Matters magazine. 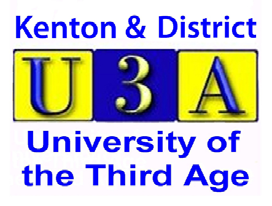 As well as events we are organising in Kenton and District U3A, do remember that you also have access to events run by the national and London Regional U3A. You can view what activities they are currently organising on their website www.u3a.org.uk/events/educational-events as well as in the national magazine, Third Age Matters. Feedback from our members who have attended these events in the past is very positive. We look forward to seeing you at some of our future meetings and group activities.